THE BURGESS HILL NORTHERN ARC DEVELOPMENTS (draft plan) for housing to be built north of Burgess Hill shows an extension to the Green Circle, Burgess Hill reaching to Bedelands Farm. This has been in the local plans for many, many years. But the current plan shows access only for walkers and cyclists! The paths on this land should be shown to include provision for horses too – the original intent and the local plans say so*! Riders in the area should look at the plans and respond to the Nexus Consultants. At their exhibition, the consultants were surprised to learn that horses could not use footpaths! Tell them that you want and were expecting horse access. Tell them where you ride and that you need to cross the roads safely (the A2300 and a new road to be built from Gatehouse Lane to St Paul’s school. Tell them anything that will help inform good decisions and provide access for all. Weight of numbers will have their effect – don’t leave it to others. 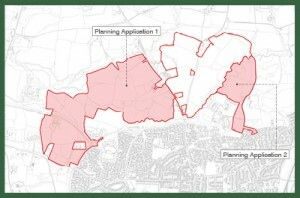 *Local plans are on the planning page of the WSCC website. Check out the current Mid Sussex Local Plan 2004 and the new District Plan 2014, currently under consultation.